We simultaneously long for and fear wild things. Wildness is freedom; it is the world revealed as beholden only to itself, indifferent to us and our need to be the center. We sense, subliminally, that the uncontrolled gives rise to the possibility of unexpected creation in a way that the controlled does not while recognizing the cliff’s edge that allows for catastrophe. Wildness is seldom connected to apples. Apples, in most minds, conjure visions of closely tended trees arrayed in ordered rows like soldiers on parade. 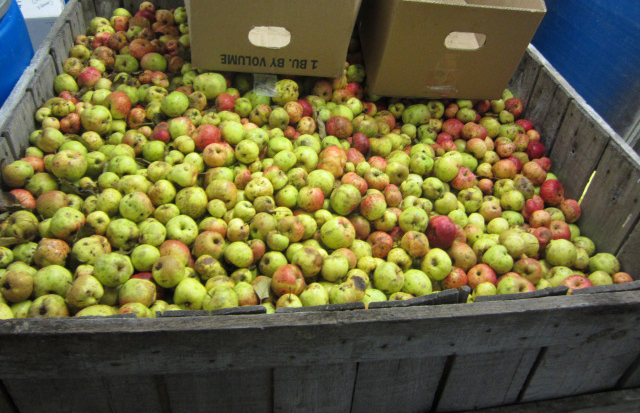 These are not the apples that attract the interest of Andy Brennan of Aaron Burr Cidery. His are the apples found in the odd corners, at the woods’ edges where the deer lost sight of them and so let them grow unmolested until tall enough to tolerate the occasional browsing. These are the apples celebrated by Thoreau in his 1862 essay Wild Apples. “Every wild-apple shrub excites our expectation thus, somewhat as every wild child. It is, perhaps, a prince in disguise.” It is the princes that Andy seeks as he and his wife Polly ramble through the woods near their small Wurtsboro, NY home and farm. And his princely finds are the key to his extraordinary collection of ciders. Andy’s cider making began in 2007, driven by economic necessity, as beer money was scarce at the time, but also by a deep interest in what sustains, what enriches, what connects – Sustenance. His vision is of a return to American cider’s roots, of scores of small cideries dotting any landscape where apples thrive, and of cider replacing wine with an evening meal. 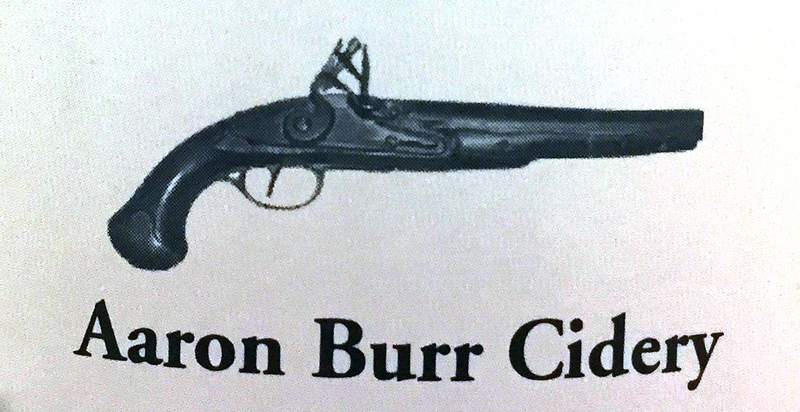 It is a vision that celebrates regions and communities, much as the cidery’s name sake Aaron Burr, who is chiefly remembered for his duel with Alexander Hamilton but who’s political philosophy embraced a decentralized democracy rather that a strong central government and, incidentally the expansion of rights for women and the enslaved. 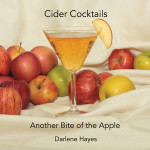 Releasing its first cider commercially in 2011, the cidery’s output remains small, in part because the volume of foraged apples from a particular location has its limits. Wildness extends to the process by which the Aaron Burr ciders are made. Striving to let the character of the fruit drive the way in which it is transformed, Andy will often let the fermentation proceed with just the natural yeasts inherent in the fruit in the absence of yeast-killing sulfites. He relies on the cold of winter and carefully timed racking to control the speed of fermentation, transferring the mostly (but not completely) fermented cider away from the lees (the layer of yeast at the bottom of the fermentation vessel), once to slow things down, and again at bottling. This sort of process takes time; a year to completion is not uncommon. The cider is never filtered, meaning that it remains a living thing as some stray yeast cells find their way into the bottle, changing its contents to develop not only a natural fizz but an increased depth of character. One recent release, the 2013 Neversink Highlands vintage, was made from wild apples found in eastern Sullivan County, NY. It is a rich gold and slightly cloudy, bursting with bubbles. Each sip reveals a new layer of flavor – tropical fruits, flint, and a resonant tannic woodiness. It is a marvel. No session drink, but one with such personality that one must stop and attend to it, consciously experience its unfolding on the tongue. It is that sense of marvel, perhaps, that has propelled the Aaron Burr ciders into the Manhattan fine dining scene. That and Andy’s willingness to spend time with a restaurant’s staff, explaining the ciders, their history, their point of view. They are not really like anything else that a staff has likely encountered, so some coaching is almost a requirement. Yet the elegance of the cider itself says as much as Andy possibly can. The word ‘authenticity’ is more than a bit over done these days, but in this instance the word is apt. Authentic. Not necessarily elegant in the way one sometimes thinks of a great wine, but these ciders are so insistently themselves, so much an expression of their place that they fairly shimmer with all that embodies the notion of terroir. Andy and a local farmer friend have recently been grafting bits of wood from the wild trees he loves the most, moving them into the order of an orchard, away from their wild wood. Will this change them, make them domesticated, and more ordinary? Perhaps not, for some of our most beloved American apples, those being rediscovered in this new age of food awareness, were once chance seedlings themselves. They made the move gracefully, as far as we know. 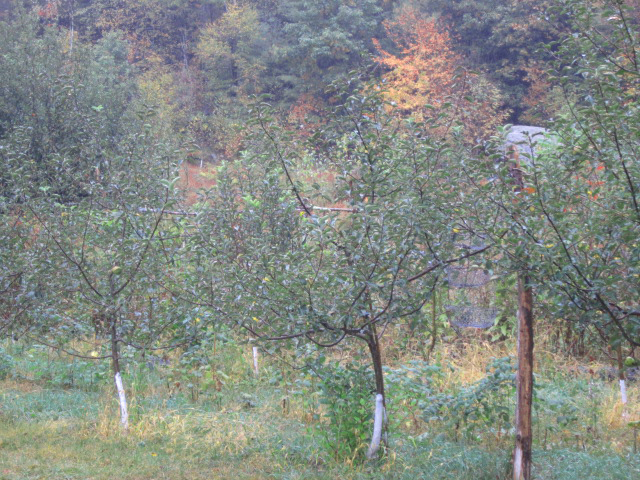 Wilding or not, these apples will at the least reflect their new place as well as their old heritage. And with Andy’s painterly touch no doubt the ciders that emerge will yet embody the microcosm of influences that create both apple and cider.